Browsing through the medical weeklies and fortnightlies of the nineteenth century, as I often am these days, one encounters many different types of writing. From polemical editorials and clinical case histories, to adverts, experiments, society reports and obituaries, the range of material can be immense. This diversity is augmented by the frequent changes in format that the journals underwent as pressure to increase circulation saw many periodically revamp their content, experiment with new designs and even change their name to increase their appeal. For me however, it is one of the relatively consistent features of the periodical that tends to be my favourite part to read: the correspondence columns. It’s here that we meet that most elusive of creatures – the periodical reader – who through these columns was able to transition from the role of reader to active contributor, sharing knowledge and opinions. Any correspondence printed was, of course, mediated and monitored through the editorial powers that be, who ultimately decided what it was appropriate to print (indeed in 1893 Ernest Hart, by then long-standing editor of the British Medical Journal, would be openly criticised for suppressing correspondence that was not in line with his own opinions.) Nonetheless correspondence columns gave readers the opportunity to occupy space in the journal, cheek to cheek with some of the most important medical figures of the day. Here they could respond to previously published reports and letters, submit in short form their own cases, opine on medical politics, or, as did often happen, become involve in some kind of spat with one of their medical brothers (or very occasionally, sisters). In truth we know relatively little about the readers of the many medical and health oriented periodicals that began during this time (something we hope to change with our upcoming workshop jointly hosted with Diseases of Modern Life!). While it’s reasonable to assume the majority were doctors, that assumption needs to be taken with a pinch of salt. Medical and health practitioners were of course a mixed bunch – hospital surgeons, physicians, nurses, dentists, general practitioners, students, druggists, not to mention those working in non-orthodox traditions. Medical periodicals often prioritised different audiences, thus reinforcing these shifting and changing identities through what was often a circular relationship between print and professional politics. Furthermore, the question of how we define a medical periodical is crucial to how we construct these audiences and contributors. This was itself a vexed question in the nineteenth century, especially in the latter decades, as a number of new periodicals emerged focused on issues like sanitation, diet and first aid, and which were primarily aimed towards a lay audience. These widened the scope for non-professionals to involve themselves in medical issues through periodical culture, and led to some soul-searching in the profession as to what exactly counted as a ‘medical’ periodical. The fact is that, as well as receiving mountains of correspondence from practitioners, laypeople often also wrote to journals like The Lancet and Medical Press and Circular on a wide range of issues; not infrequently they were published. This diversity in readership can at least be partially accessed through one of the less well-documented parts of medical periodical correspondence: the ‘answers to correspondents’ (or similarly titled) columns that featured in a number of the medical weeklies and fortnightlies. This was usually separate from the main correspondence column and included much shorter notes and letters. The Lancet started its ‘To Correspondents’ column in 1850, claiming to be ‘literally overwhelmed by the number of communications on hand’, and begged writers for shorter correspondence. 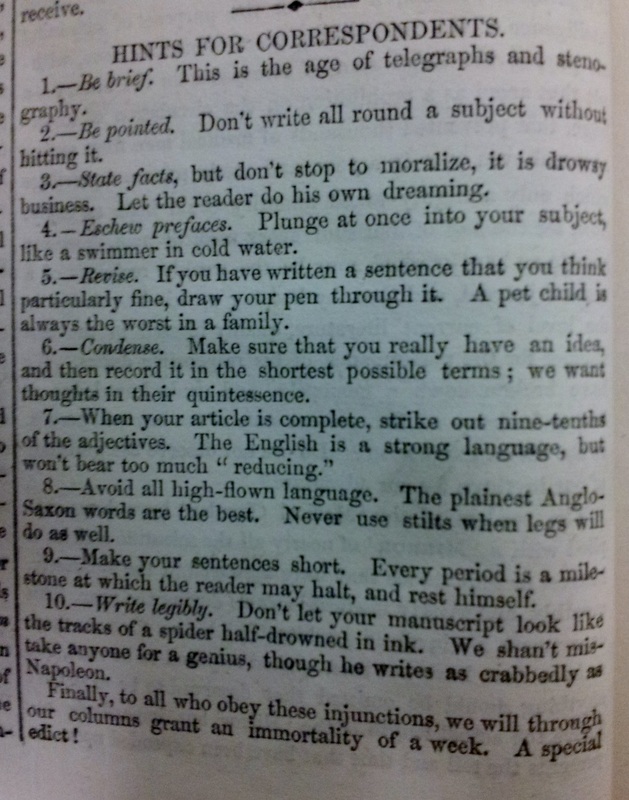 This sentiment was echoed by the Medical Press and Circular in 1852 when they published a semi-humorous, semi-serious guide to those readers who wished to be granted ‘immortality of a week’ through the correspondence pages (shown in fig.1). Fig, 1 Medical Press and Circular (1852). Credit: Royal College of Surgeons of England. In what was likely a subtle mode of hierarchy, it was this type of column that tended to include contributions from laypeople rather than the main correspondence page. As I have detailed in a previous blog, I have found many letters from self-proclaimed laymen in The Lancet, writing in on a whole range of topics. Some of these columns also published answers to individual correspondents whose original letters were not printed at all, as exemplified by the image below from an 1893 edition of The Medical Times and Hospital Gazette (fig.2) This feature, which was common to nineteenth-century periodicals of all types, is simultaneously fascinating and frustrating to me, providing glimpses into narratives of health, medicine and more but which, alas, forever remain half a story. Mostly published under pseudonyms, the absence of the writer’s true identity as well as the original query can make it hard to derive much from the dialogue. Take the Medical Times excerpt, where four very different queries are answered. The response to correspondence from ‘Anxious’ is a simple and (intentionally or unintentionally?) humorous ‘yes’ ; the whys and wherefores of ‘H.R’’s query are equally hard to make out. 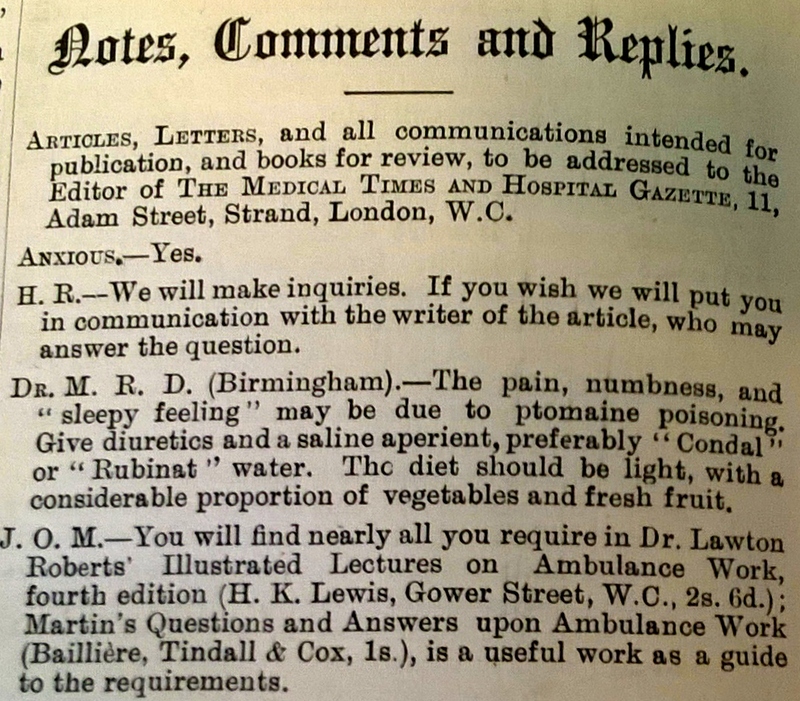 The question posited by ‘Dr M.R.D’ sees the Medical Times shift into the role of dispenser of medical advice, while ‘J.O.M’ is instructed to read Lawton Robert’s Illustrated Lectures on Ambulance Work, a book for amateur first-aiders, suggesting the correspondent making the enquiry was from outside the profession. 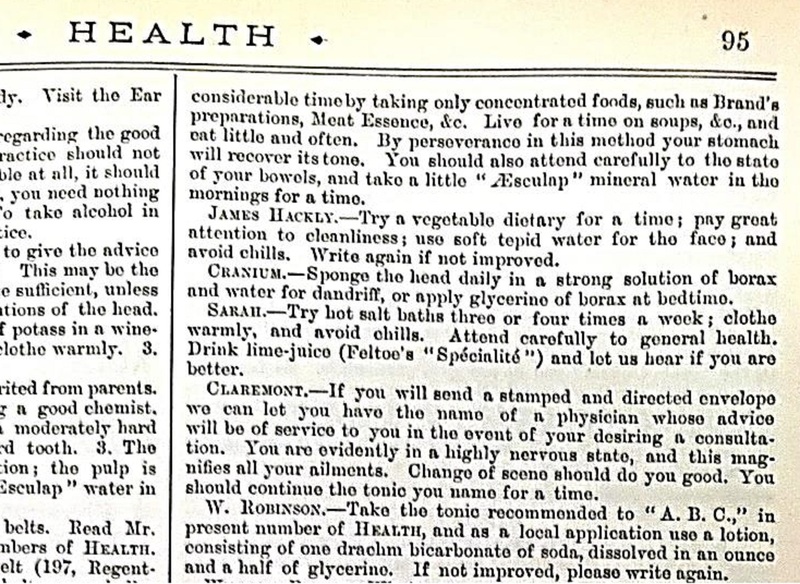 This format was replicated in the ‘popular’ health journals, such as Health, pictured in fig.3, where the public could, for the cost of sending a letter, bypass the doctor and instead receive answers to their medical queries from the journal. Fig. 2 Medical Times and Hospital Gazette (1893) Credit: Royal College of Surgeons of England. It is interesting to think about what exactly periodical editors, publishers and audiences got out of these columns. Were readers frustrated at only ever knowing half the story? Or was the information dispensed in advice columns stored away for future reference? And who exactly was writing the answers? These are some of my own queries, although sadly I have no journal on hand to answer them for me! It would be unfortunate if we were to view correspondence columns as an aside to the ‘important’ business of clinical material. They are, to my mind, the beating heart of the journal, laying bare the concerns and anxieties of readers, as well as the role of the journal as facilitator to all types of contributions, and not just those of doctors. Medical Times and Hospital Gazette 21 (1893) 44 & 92.